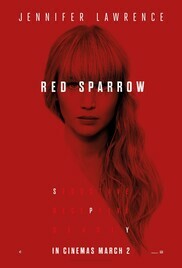 Plot: Ballerina Dominika Egorova is recruited to 'Sparrow School,' a Russian intelligence service where she is forced to use her body as a weapon. Her first mission, targeting a C.I.A. agent, threatens to unravel the security of both nations. Director: Ballerina Dominika Egorova is recruited to 'Sparrow School,' a Russian intelligence service where she is forced to use her body as a weapon. Her first mission, targeting a C.I.A. agent, threatens to unravel the security of both nations.